…to inspire your weekend plans… mix in a little DIY project, gardening, baking, art making, or a trip to the beach (hey, it’s messy!). Something outside your normal routine. I don’t know about you, but I sit in front of my (dearly beloved) computer for several hours each day and it’s all so clean and sterile! Thankfully, I have two tots who like to keep life very real and I have a strong propensity to get messy while creating artwork …and somehow, my kitchen is a mess everyday by noon (what’s up with that??). Now, I’ll be the very first to say that a mess does NOT equal success. Gracious no. But these is something pretty awesome about letting go, and just making or doing something amazing, regardless of the fall out, am I right? It’s been three days and I’m still rocking (read: trying to hide) these messy punk nails! 1. This unique poster will only show is message if you get a little dirty cleaning it off. Message received!! Poster concept and design Roland Tiangco, seen first on Kate Pruitt Blog | 2. Inspiration to get in and get dirty from Sass and Peril. Images can be found here. | 3. “Unplug and get your hands dirty” poster from Studio on Fire. Any exciting plans for this weekend? Enjoy it! See you Monday! This is so inspiring! Reminds me of when I was a kid doing arts and crafts and getting sooo grungy, filthy, dirty, but by making things and being creative. Nice nails are for movie stars – time to get a little paint on the hands. Ya!! Have a great weekend and enjoy getting a little dirty! Absolutely love this. Particularly the manicure. Haha! Thanks…. ;). Have a great weekend! Now that is a manicure! It’ll be all the rage in no time! I love that poster from Studio On Fire!! So so much. 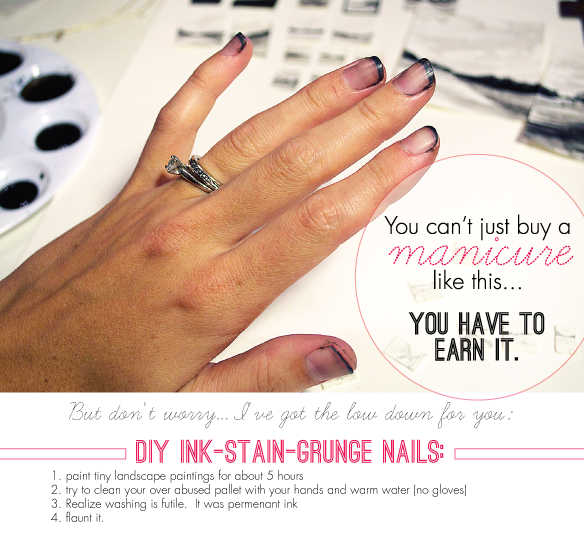 And your manicure rocks…:) Thanks for sharing and for the inspiration.